Galaxy Note 7R Leaked Photo Shows 3,200 mAh Battery; Get FCC Certified & Appears on Geekbench - Playfuldroid! Rumors are claiming that the refurbished edition of Galaxy Note 7 will be unveiled in the next month. It is expected to launch as Galaxy Note 7R. The SM-N935KOR, SM-N935S, SM-N935K, and SM-N935L of Note 7R has received approval from Federal Communication Commission (FCC). 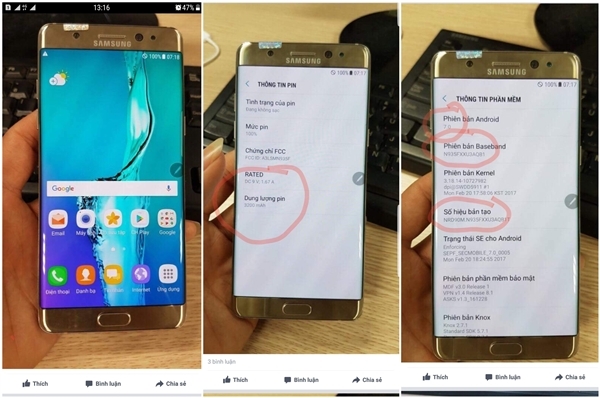 The other alleged model numbers of Note 7R such as model numbers like SM-N930, SM-N930FD, SM-N930F, SM-N930K, SM-N930L, SM-N930S, SM-N930X and SM-N935S have also received Wi-Fi Alliance certification. 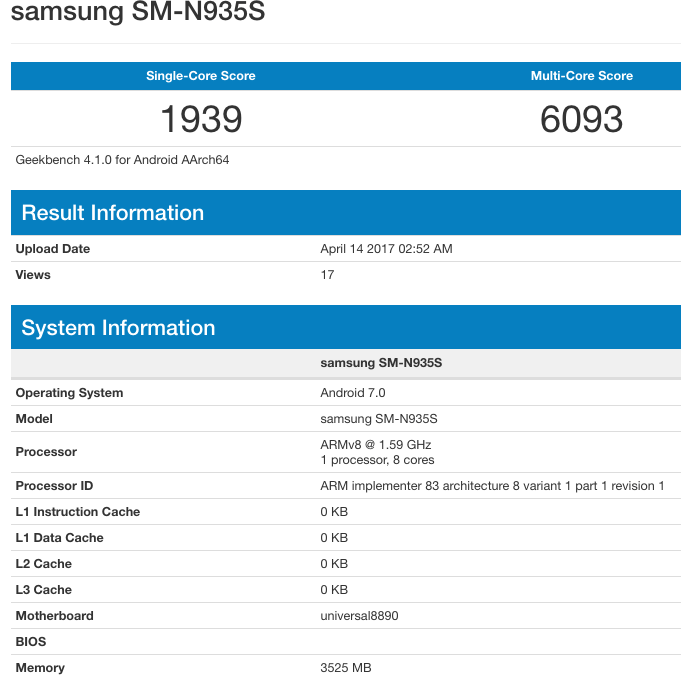 The SM-N935S has surfaced on Geekbench benchmarking platform. It shows that the phablet is powered by Exynos 8895 SoC that clocks at 1.69 GHz. It is the same chipset that powered the original Note 7. The Exynos 8895 SoC on Note 7R will be supported by 4 GB of RAM. The phablet will be running on Android 7.0 Nougat OS. The purported Note 7R has scored 1,939 points on single-core test and 6,093 points on multi-core test. There is another listing of the same device on Geekbench that is powered with Exynos 8890 chipset. The Note 7R is expected to come with same specs as the original model. Hence, it is expected to come with 5.7-inch quad HD resolution supporting dual-edge curved display, 64 GB storage, 12-megapixel Dual Pixel camera and 5-megapixel selfie snapper. A leaked photo that shown above shows the alleged the Galaxy Note 7R with 3,200 mAh battery instead of the 3,500 mAh battery present inside the original Note 7. Also, the phablet is shown running on Android 7.0. The Note 7R is expected to be available with a pricing of 4,500 Yuan ($652) and will be coming in four colors like Coral Blue, Silver, White and Black.